Social media has been such a blessing in my life because, besides getting to blog and share my creativity in different outlets, I also get to meet so many friends all over the world that I would not have met otherwise. When I meet woman who inspire and uplift, do not compete or feel threatened, love sharing others’ accomplishments and helping them…I find an instant connection with them and know they are kindred spirits. In speaking of sharing each others’ accomplishments, I want to share these women who inspire me here on my blog from time to time so that you might also get to know them and find inspiration from them. So today I invite you to be inspired by “The Design Twins“. Julie Lancia and Jodie Kammerer, a.k.a. 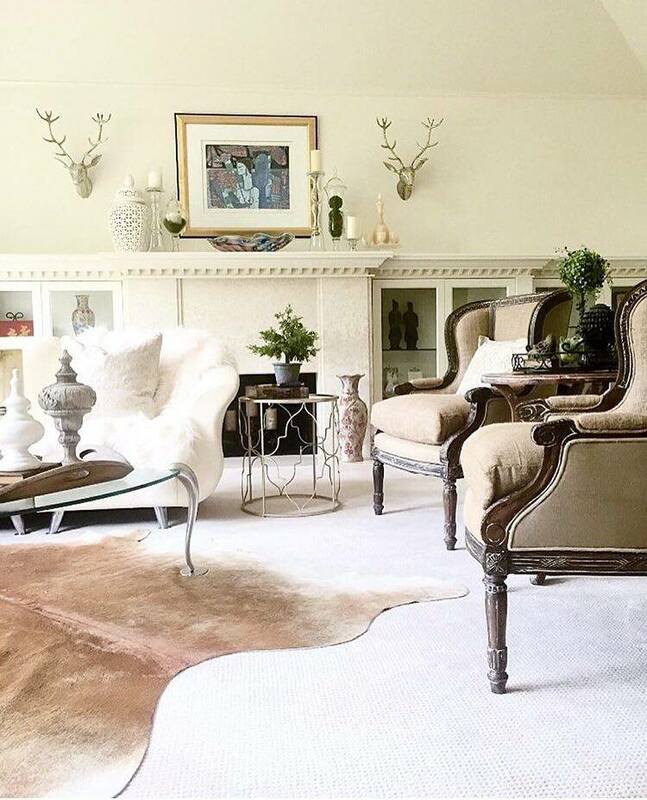 “The Design Twins“, are twin sisters who both joined Instagram and shared their homes and passion for interior styling in the home decor community. They have both shared their faith, their kind hearts, and their incredible talents with those that follow them and are truly inspirational in so many ways. It gets even better….they are working on a new blog that is soon to be up and will be a fabulous source of all of their projects, thoughts, and ideas. I interviewed these dear friends recently to get to know them better and share with you their joy of homemaking and it’s value in their lives. Come and enjoy their homes with me! Where did your passion for interior styling come from? Julie: I am very in tune with and affected by my surroundings. I can be inspired or completely distracted. It’s difficult for me to think or focus amidst clutter. Conversely, I am stimulated by harmonious, beautiful decor. From this, natural connection I have with my surroundings, has grown a strong desire to create beautiful, inspiring spaces. When Jodie and I were in our twenties we happily lived together with our husbands in our first house. We were obsessed with decorating and DIY. Back then we didn’t have any of the resources we have now. We literally would look at decorating magazines, hatch ideas, head to the hardware store, and have at it with one overriding truth: together we can do anything! 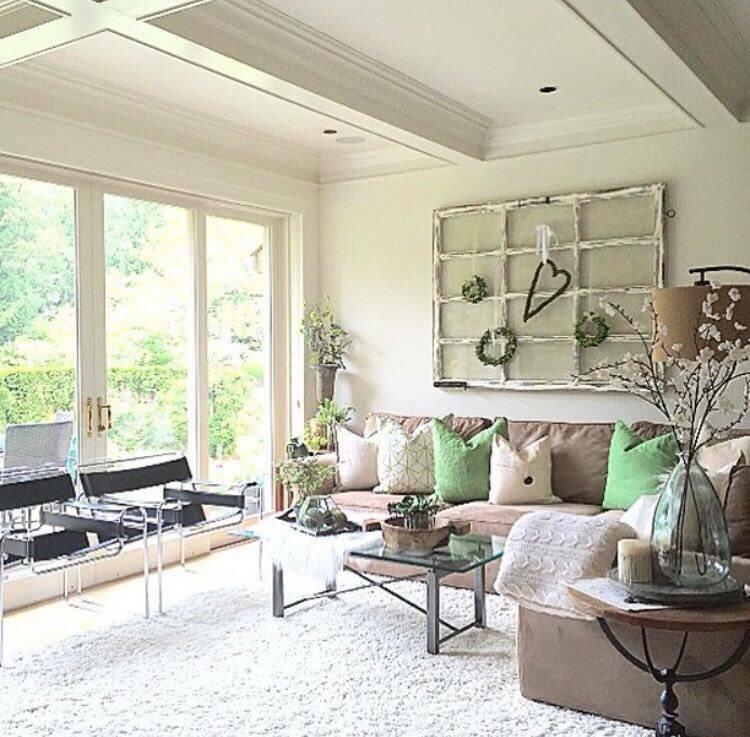 Jodie: My passion for interior styling is really my solution to finding happiness where I am. Unlike most, I came to loving interior decorating in a very round about way. I have always searched for creative outlets in either music or scrapbooking or fashion. However, when our financial situation changed drastically a couple of years ago, I had to make a lot of personal changes. I used to look for ways to get out of my home. I focused mostly on travel and shopping for inspiration and happiness. When I realized I had to stop spending, I started trying to find ways to make small improvements through DIY craft projects and, slowly but surely, found out how rewarding it could be. 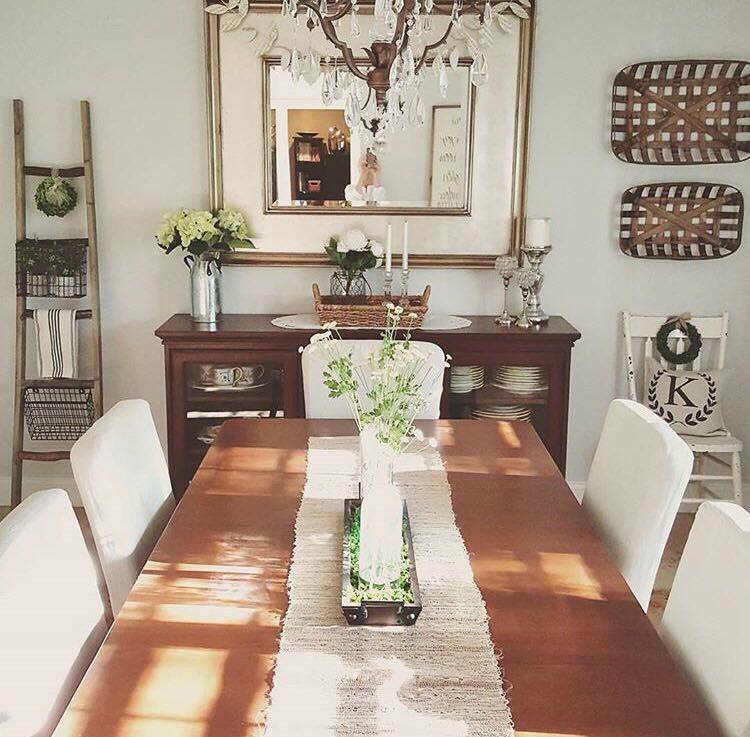 Jodie’s kitchen nook has a beautiful balance of farmhouse and traditional style. How would you describe your style and how do you make it your own? Julie: Defining my style is as challenging as it would be to define me. My one constant is change! I am not the same from minute to minute and my style is an ever-evolving reflection of that reality. We both embrace change. In fact, we crave it. At the same time, we have constraints all around us and consider ourselves to be practical girls. We are not wasteful nor necessarily that spoiled. For example, we don’t look at a room and do a complete overhaul EVER. I work piece by piece almost always repurposing, reinventing, not wasting. We of course LOVE to shop, but the question, “do I need it?” and “where would I put it” always comes into play. My style is eclectic and ever-evolving currently a combination of farmhouse, rustic, contemporary, and french country cottage. 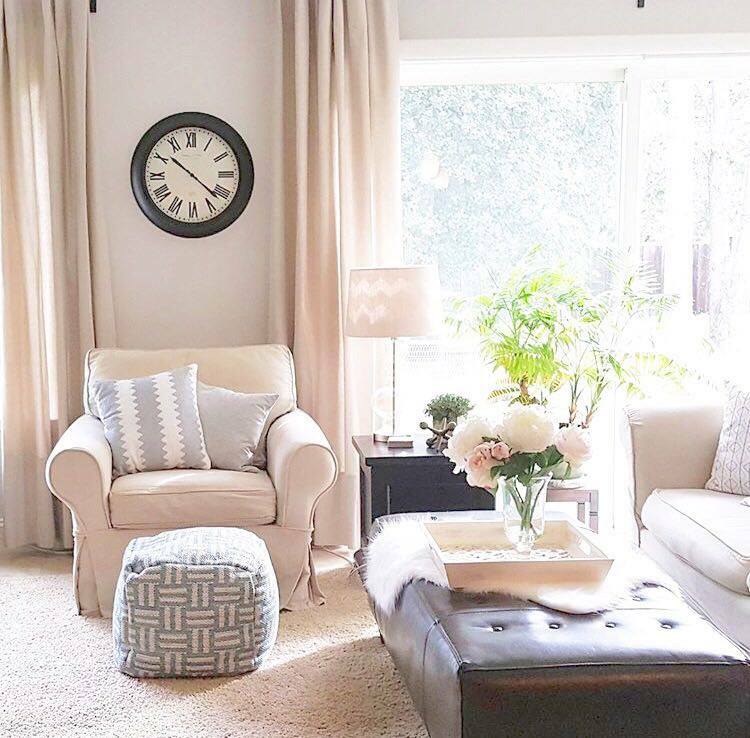 Julie’s beautiful family room allows a lot of natural sunlight to brighten up their home. Jodie: My style is very casual and livable. I love the feeling of openness and light. I love clean lines so I am constantly trying to find a balance between simplicity and detail. I also love the character of something vintage, but love some more modern elements. So again, it’s a question of balance. Some would call it “eclectic.” I love anything classic and elegant, but again, real life gets in the way and I end up choosing comfortable over elegant as a result. What do you love most about your home? Or what is your favorite room/space? What does being a homemaker mean to you? Julie: Being a homemaker I can sum up in one phrase, “a labor of love”! I stayed home for many years but returned to part-time work when all my children were in school to fulfill my creativity. 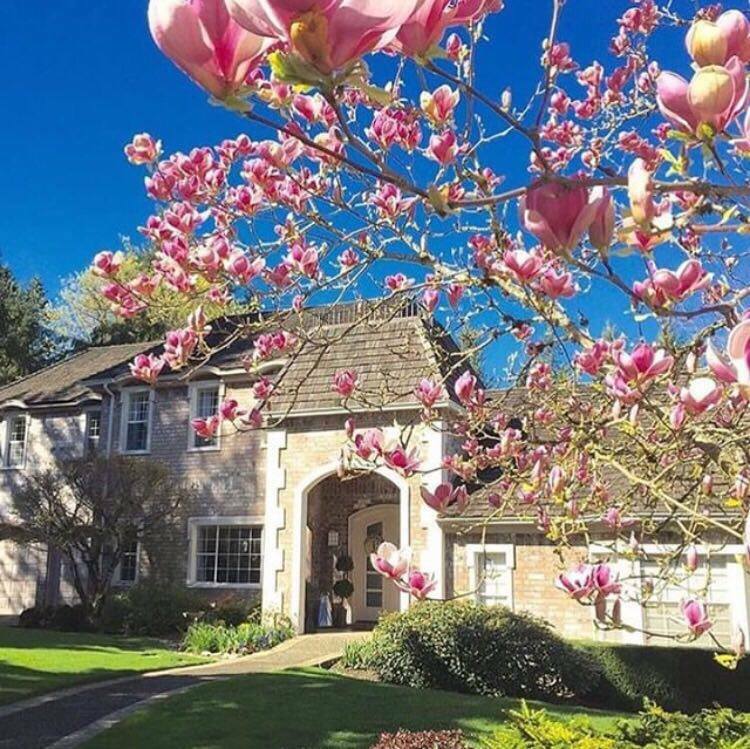 When we moved 3 years ago I spent a couple years getting myself and my family settled and acclimated to our new home in Washington. It was solitary time, because my children were growing and needed me less and I had left all my friends behind in California. During this period I really had time to ponder what it was to be a homemaker and had to reach deep inside in order to find meaning and motivation to do things like making beds. It was a meditative for me. During this time I heard God calling me. The slower pace and solitude allowed me the space I needed to listen and soul search. Each day I would do the same things: clean, tidy, organize…and listen. I prayed as I made the beds and cleaned each child’s room. Instead of feeling resentment at their inability to do this on their own I let the love pour out of me. I was grateful. I would think of each of them, pondering over memories from their lifetimes, from past and current day; sometimes I would be so moved I would leave them little love notes. In so doing, I found joy in the mundane, and my faith grew. I knew God was about to direct my life in new ways, and for once, I was ready to listen. I grew a patience and a trust I never knew I could have. Jodie: To me being a homemaker means creating a space that nurtures family time and a lifetime of family memories. Our hallways serve as gallery walls hung with photos of my children through the years. The boys’ rooms are decorated with framed artwork that they have done and the shelves with beloved projects. Jodie’s dining room is elegant and functional. How do you make your home a haven where your loved ones enjoy gathering? Julie: I think it is so important for a home to really work for a family. A home functions when spaces cater to the collective and individual needs of everyone. As children grow, spaces need to evolve to fit. Now that our children are 13, 17, 19, our house needs to provide different things than it did when our children were babies, toddlers, or even gradeschoolers. My husband and I are raising independent children who we respect. With our respect for them comes a mutual respect. Everyone needs their own space to work, reflect, and have enough alone time to discover their own selves. There is a communal teen space and a communal adult space, and an all-together family room in the center of the home. We mainly gather in the family room and kitchen. I seek to create spaces that are comfortable and inviting, never too formal. I want my kids to feel like they are welcome everywhere. Julie created the perfect loft for her teen children and their friends. Jodie: My home isn’t perfect and isn’t static. For us it’s not a place to just look at and admire. It is alive with movement and change, evolving with our family’s changing needs and passions. Jodie’s stunning chandelier and fresh roses make for an exquisite view. How do you feel you influence each others’ style and/or decisions with your home? Do you consult each other or ask each others’ opinion about changes you make? Have you done any home projects together? Julie: Jodie and I are in CONSTANT contact. Before most large purchases we will consult the other. Big design changes are always consulted. We send most IG pics to each other before posting. We exchange feedback as a matter of course. Because we are not the same person; our styles are not identical because our aesthetics are not identical. As a general rule, Jodie seems to like a little less (less is more) and I tend to go bigger,bolder,louder. That is a reflection of our personalities. But we respect each other’s style tremendously. Last summer Jodie arrived for a visit and announced immediately that we were doing chalk paint. She held my hand the whole way and it was great. I’m not sure if I would have done it without her. Back in our twenties we did all kinds of projects together and we had an absolute ball. 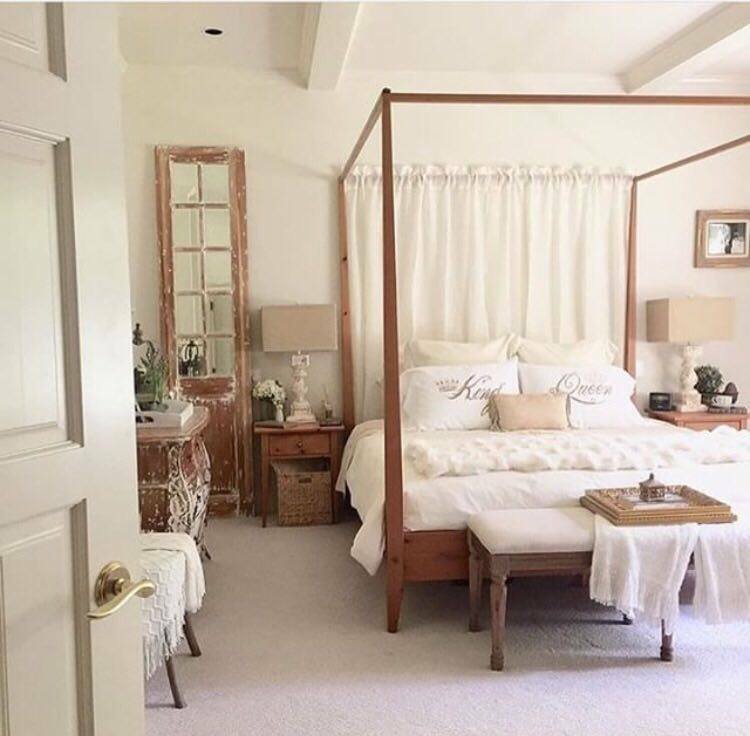 Julie’s master bedroom has a strong, rustic elements with a romantic, vintage flair. 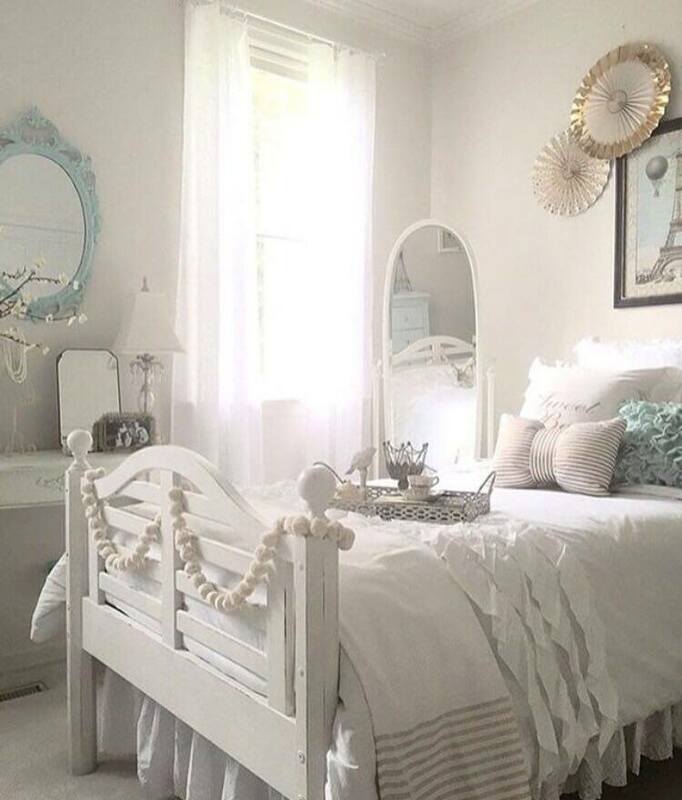 Jodie: Julie and I have differing styles, but influence each other’s choices and decor decisions daily. We don’t always consult each other with every purchase, but definitely include each other in making changes and check with one another about final details and touches. If we have decor dilemmas the first thing we do is reach for the phone. Whenever we want to try out something new (DIY project) we look to the other for advice and support. The first time we chalk painted we tackled the project together. (It turned out great!!) We each have our areas of confidence and strength so where I need help, she reassures me. Where she is unsure, I support her. For example, I am more confident with DIY projects and tackling new techniques sometimes. 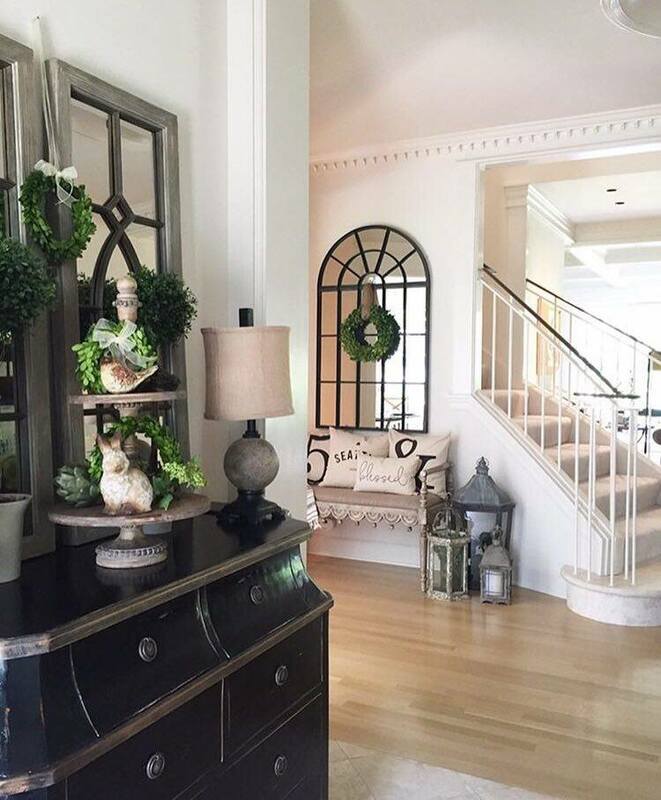 Julie’s strength is with arranging vignettes and decorating with details. I think sometimes I am better looking at the “big picture”…picking colors or knowing when something needs to be changed. Julie is amazing with the details. 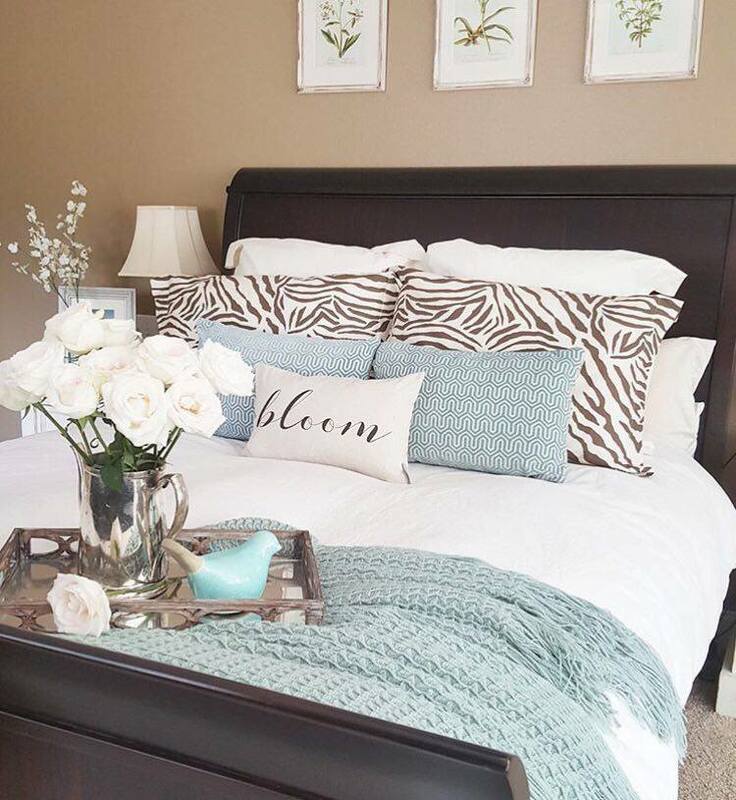 Jodie’s master bedroom is such a perfect blend of clean, masculine lines with a touch of femininity. 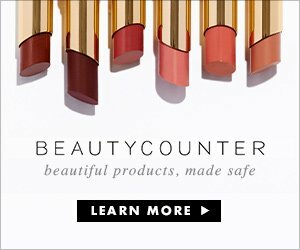 How has your style changed most over the last few years and why? 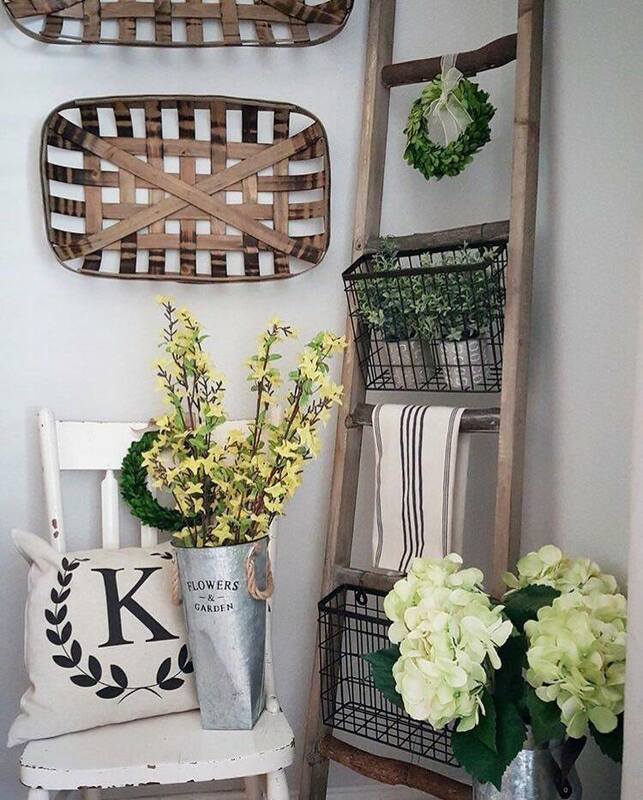 Julie: Currently I am integrating a more rustic, farmhouse style with touches of French provincial and cottage influences. I am integrating these styles into my existing decor, piece by piece, room by room. In my early days of decorating, my husband was involved and influenced me toward modern. Living in Singapore added to the modern edge but infused some vintage Chinese and Asian antiques into the mix. Then back to the states our home in California for 14 years was a very modern home, so that influenced my home decor style. By the time I moved to Seattle 3 years ago I was ready, more than ready, to evolve! I bought a more traditional, classic home with some modern elements. I related to the mix of styles presented by this home. As I’ve been creating this home I’ve had strong influence of farmhouse from IG and also the store where I work, which features a mix of styles, including a lot of farmhouse and modern industrial. Julie has truly found some fabulous rustic, vintage-style pieces. 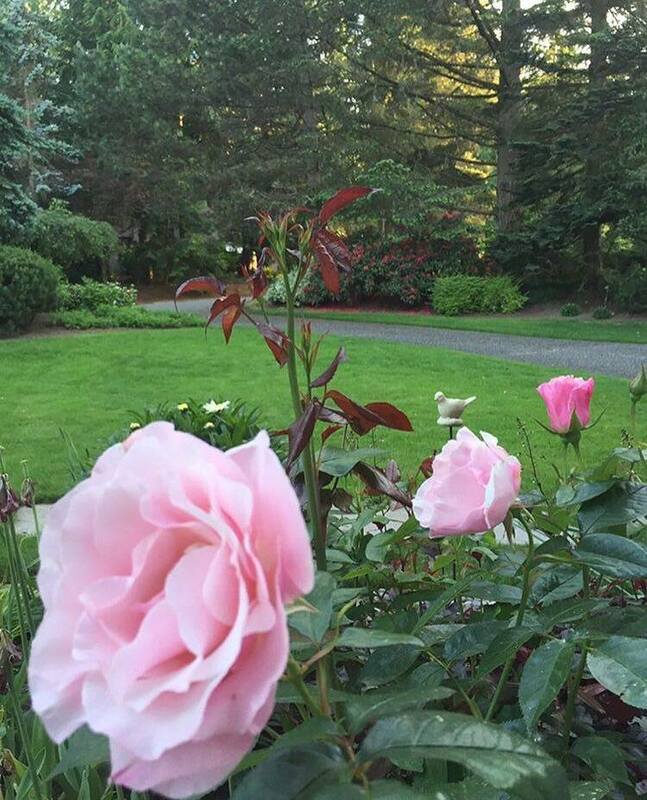 Jodie: We are gemini….and everything is always in a constant state of evolution and change for us! the past year I have really transformed my house on a very tight budget. It was pretty much a blank slate that hadn’t been attended to since we moved in 8 years ago. I’m mostly proud of how I was able to transform my home without spending much at all. I started by going through boxes that hadn’t been opened since we moved. It was like treasure hunting for decor items that I already owned! The next thing I did was make DIY drop-cloth curtains….first for the great room, then for the dinning room, then the living room. For $10 a panel and $20/window hardware all of a sudden I had a NEW HOUSE! I felt happy! I felt empowered and excited about what possibilities lay ahead. That was just the beginning! 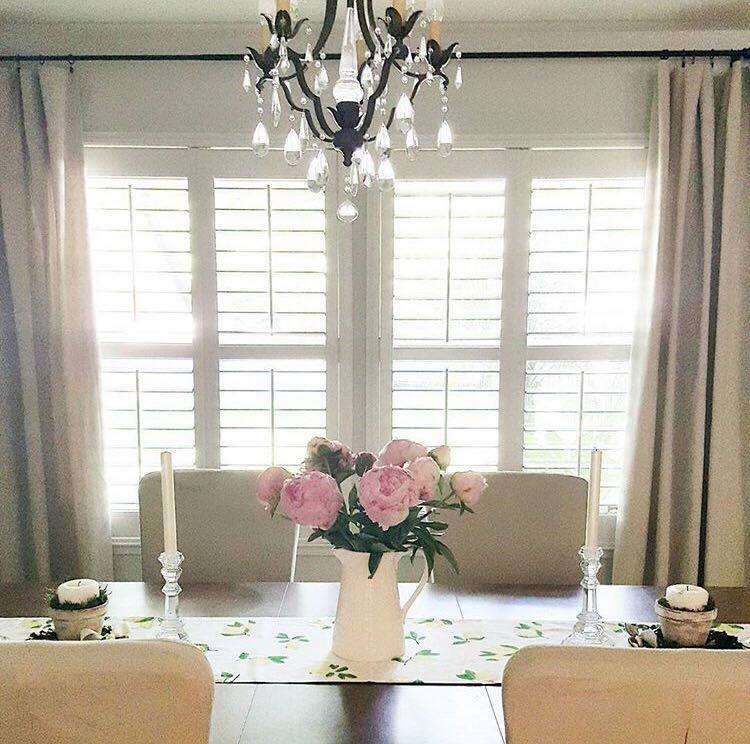 Jodie has a great vision for making her home elegant by creating a look for less, as she did with her window treatments. What have been your favorite transformations or makeovers in your home? Julie: When we purchased the home there was a ton of built-in recessed lighting, which was great because it was like a prewired blank slate! It allowed me to really make my mark on the home by adding my own unique fixtures. In two years we’ve added 8 chandeliers, and I am not done yet! My family thinks it’s funny, but lighting is a powerful way to make a huge style statement, and I love to make a statement with decor. 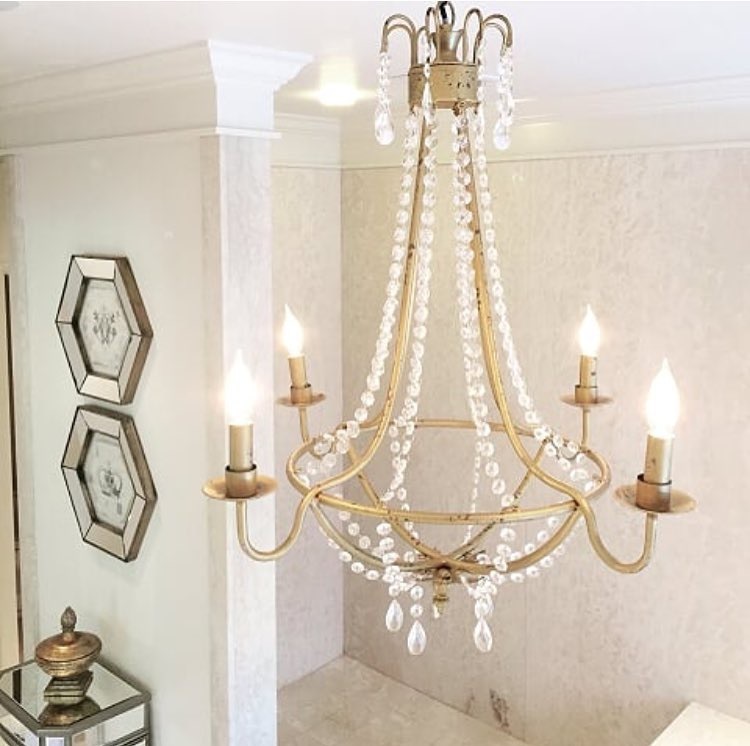 Julie picked this chic chandelier for her master bathroom for added glam. 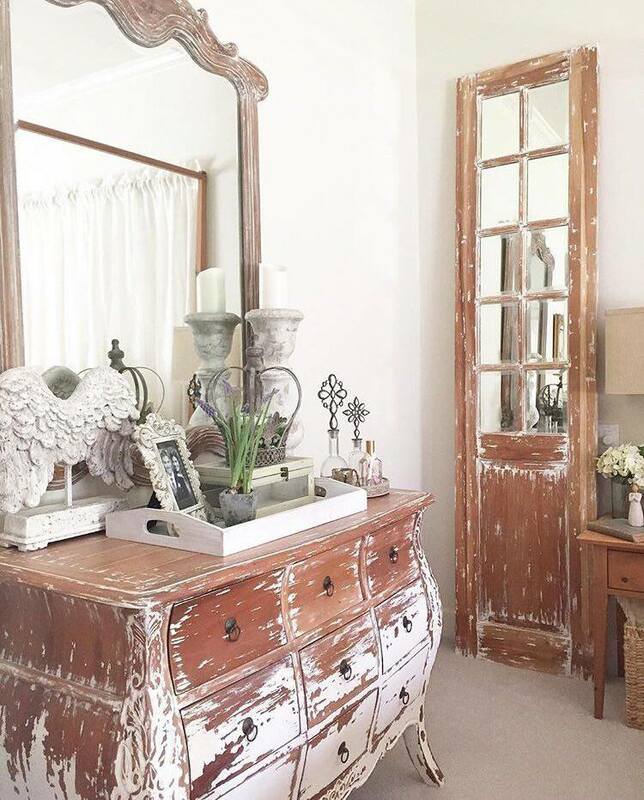 Jodie: I started painting this past year…chalk painting old furniture, painting the walls! It was a big year for change and I was just getting started. 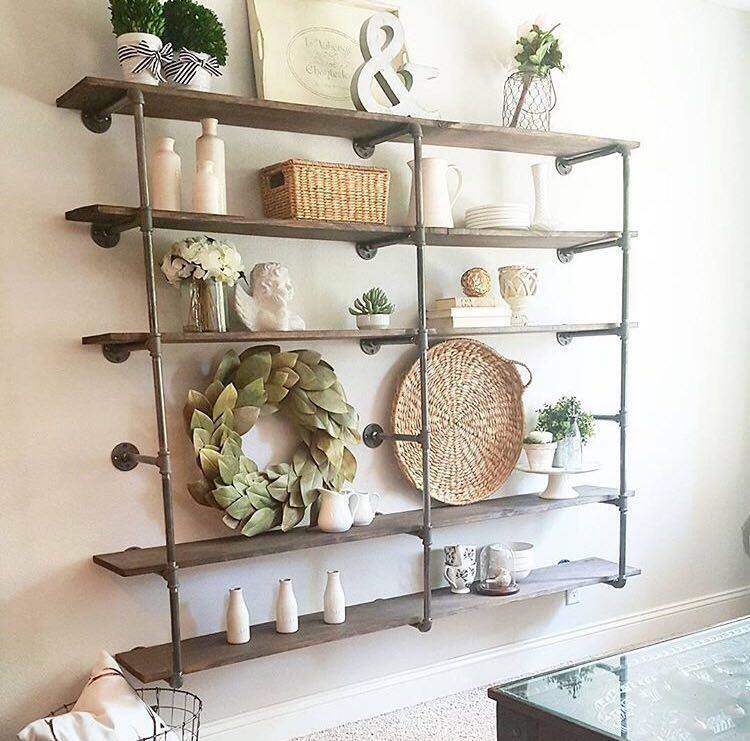 The last project we did included my husband, and together we built industrial pipe shelves. They turned out amazing and now we BOTH have something that we are very proud of. Fabulous industrial shelving that Jodie and her husband put up this year. How does your spirituality play a part in the feel of your home? 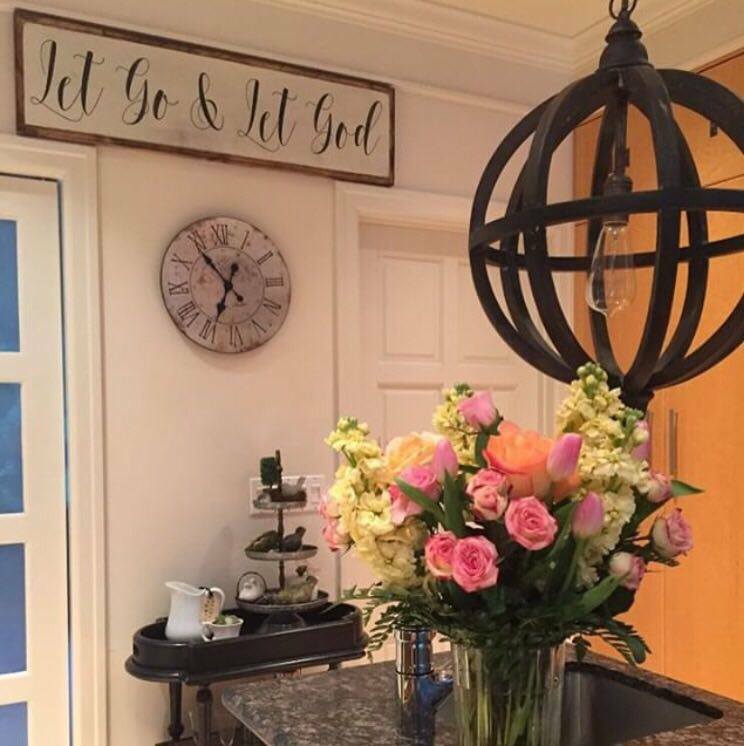 This sign in Julie’s home is a lovely reminder of her faith in God and that He in mindful of her and her family. Jodie: These last couple of years, as we have faced some very scary financial challenges, my spirituality has become more and more important to me. Where my answer to problems used to be to buy something to fix it, now I have to look to my faith in God and his plan for me to find comfort and strength. When I had to make serious lifestyle changes a couple of years ago, and I turned to the solace of my home. I needed to find happiness inside my home rather than looking for it elsewhere….and that’s what started my creative juices flowing. I found creativity and crafting skills that I didn’t even know I had. This serves as a metaphor for my spiritual happiness as well….where I might have just bought my way to a happy outcome, now I have to look inward…to my relationship and trust in God to find the reassurance that I need. 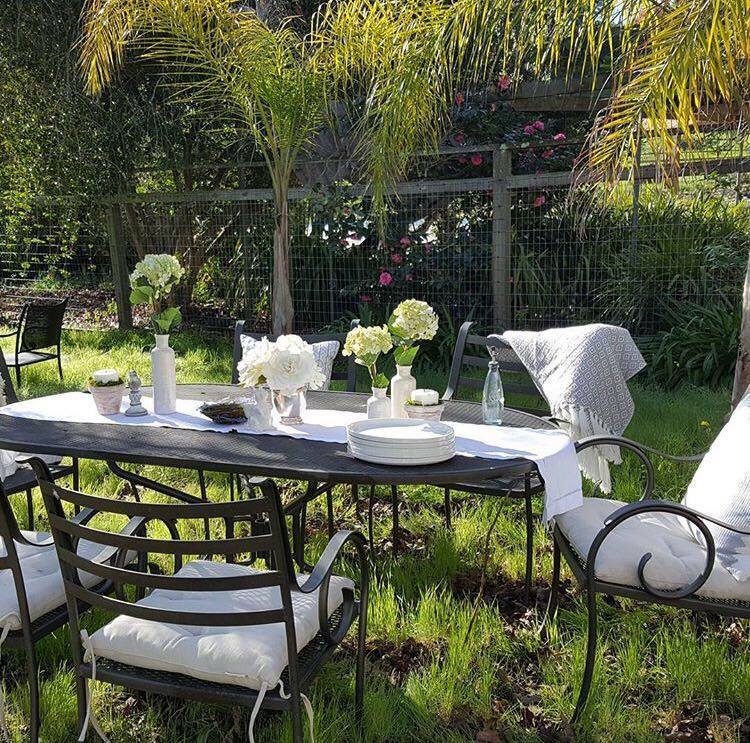 Jodie’s breathtaking backyard allows her to retreat somewhere peaceful, whether it’s alone or entertaining friends. What is it that you want others to know about you after leaving your home and what is it that you want them to take away? Julie: My home is a reflection of me, my family, my travels in the world, my evolution as a person, a woman of God, a mother. I don’t try to be anyone else but me. I want people to get a sense of who I am and what I value. I want people to feel comfortable and welcome. I want people to be inspired to decorate with confidence. I don’t follow rules, I don’t worry about labels or impressing people. I am just me, and God created me to speak truth, light, and love…I hope my home speaks that for me. 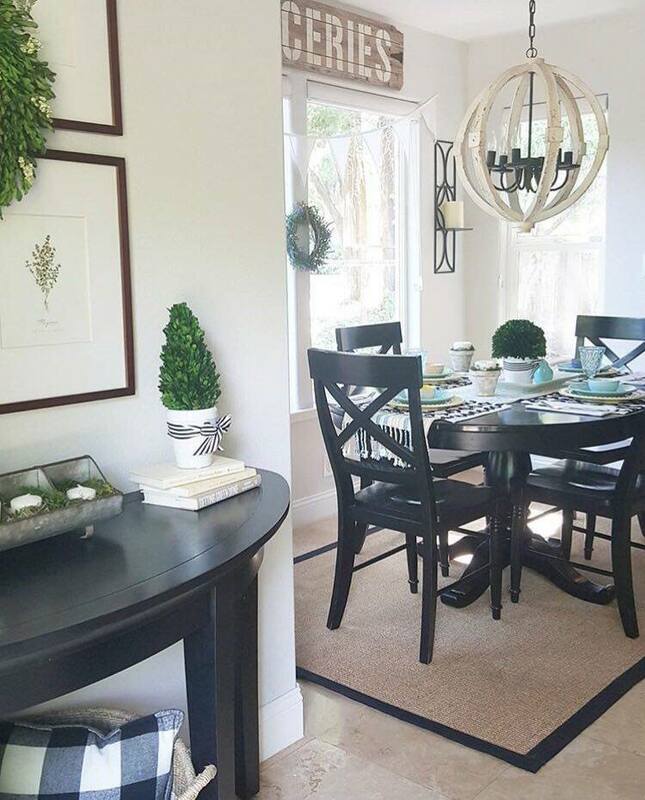 Julie knows exactly how to bring comfort to sophistication and that is what you see throughout her home. Jodie: Above all else I want people to feel welcome and comfortable, accepted and at ease in my home. 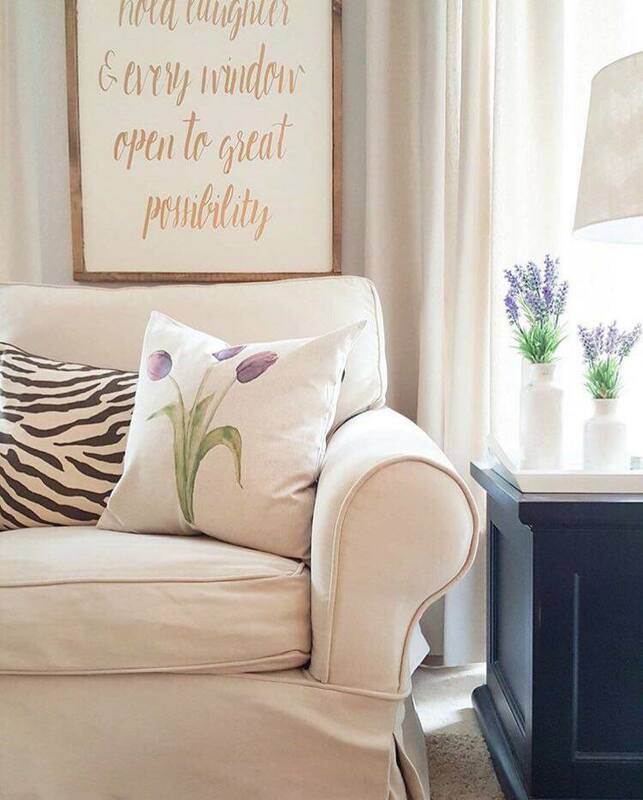 I want my home to reflect my own optimism and the joy I have in creating a beautiful, casual inviting environment. There is nothing overly fancy or intimidating because that’s just not me. I don’t believe in labels or exclusivity I am not above anyone, and I don’t want to portray a lifestyle that feels overly privileged or pretentious. Jodie’s home is inviting, warm and elegant, just as she is. With two sisters of my own and all of us having such strong devotion to be mothers and wives and homemakers, I can truly understand what kind of bond these lovely “Design Twins” share. 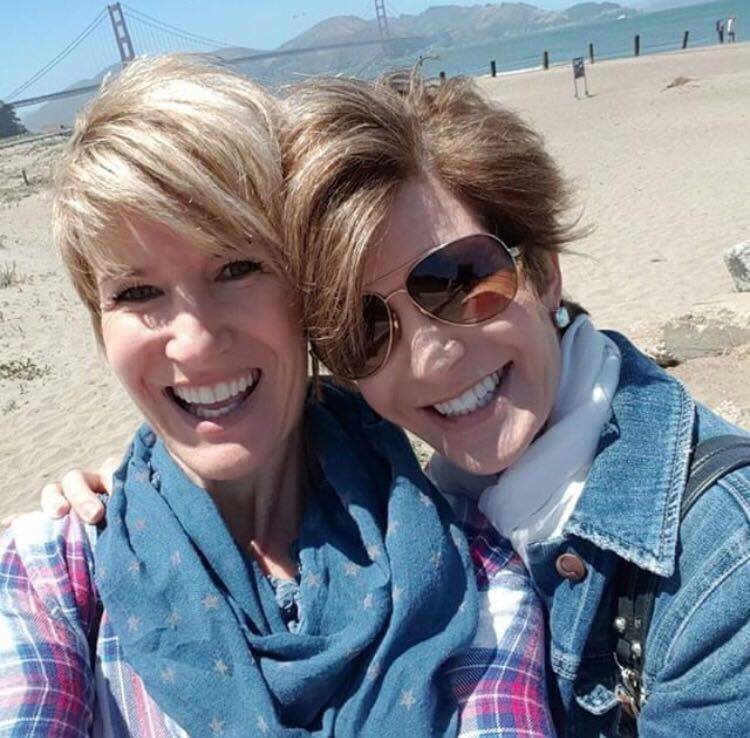 I was drawn to Julie and Jodie in seeing their sweet connection with each other and pure hearts for sharing with those around them. These 2 twins sure know how to have fun! They always make time for each other and nurture their special bond, sisterhood and friendship. 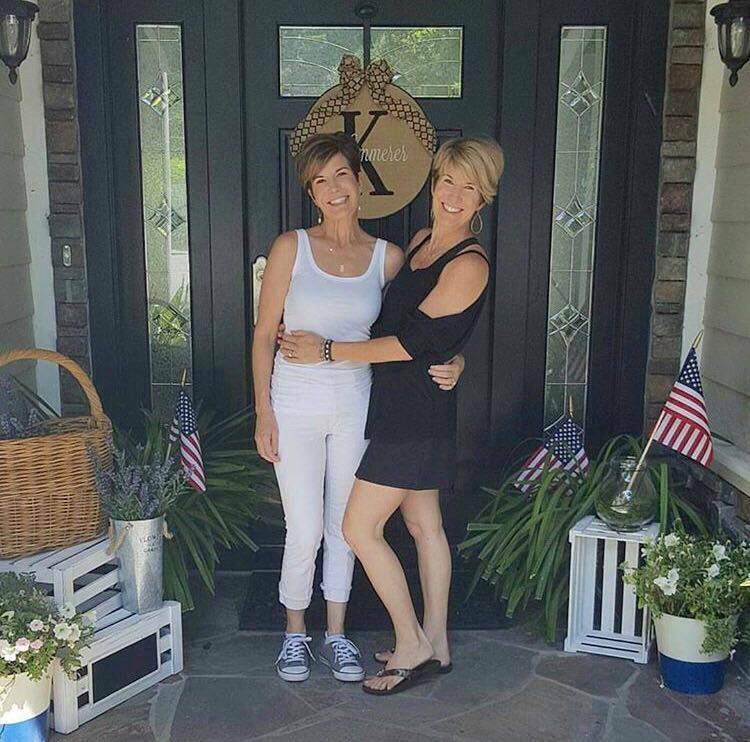 However strong your passion is to create a beautiful home or whatever your style may be, I hope you take away something from Julie and Jodie today that will strengthen your desires to create. 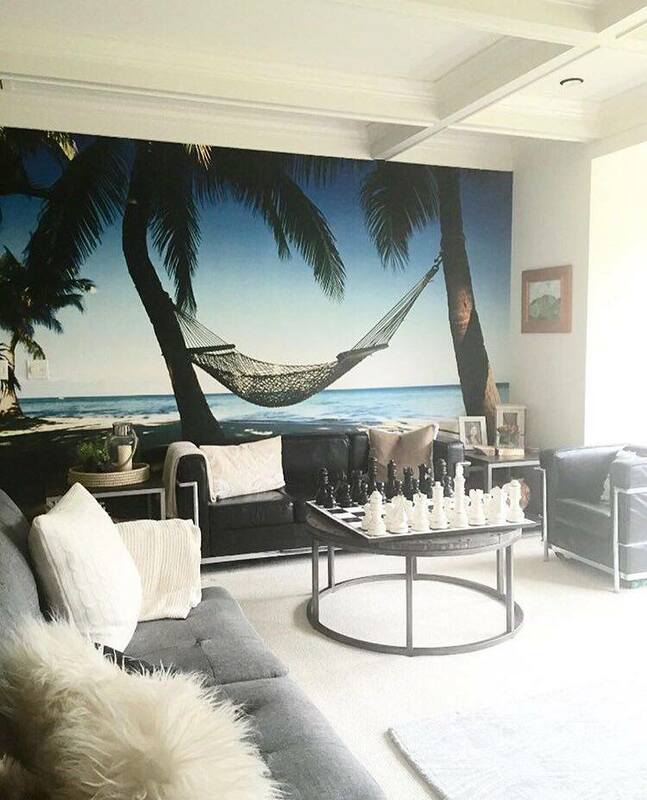 Not only creating beautiful rooms and spaces, but creating a place where your family and those you love can come and gather and feel something special when they’re there and have a reprieve from the rest of the world. 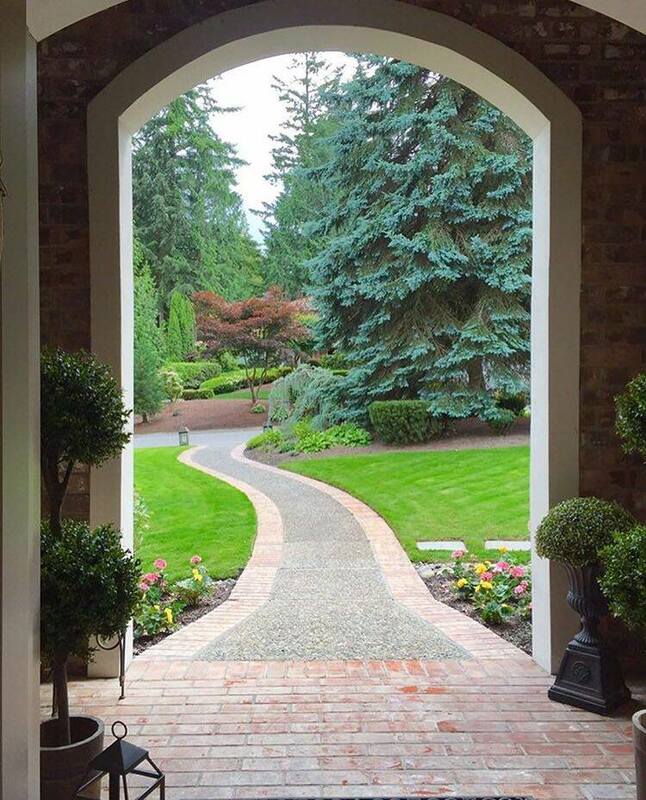 It was said once, “A happy home is but an earlier heaven”, Thomas S. Monson. I believe that is true by not only having strong family relationships and a peaceful, uplifting, and safe environment but also by making home a lovely place to retreat to and enjoy. I’m sure we can all agree that my dear friends, Julie and Jodie, have accomplished that very thing. Please visit them on their new BLOG to follow along in their inspiring journey. Oh how I love these two beautiful ladies! Their faith and kindness and immeasurable talent have blessed me! 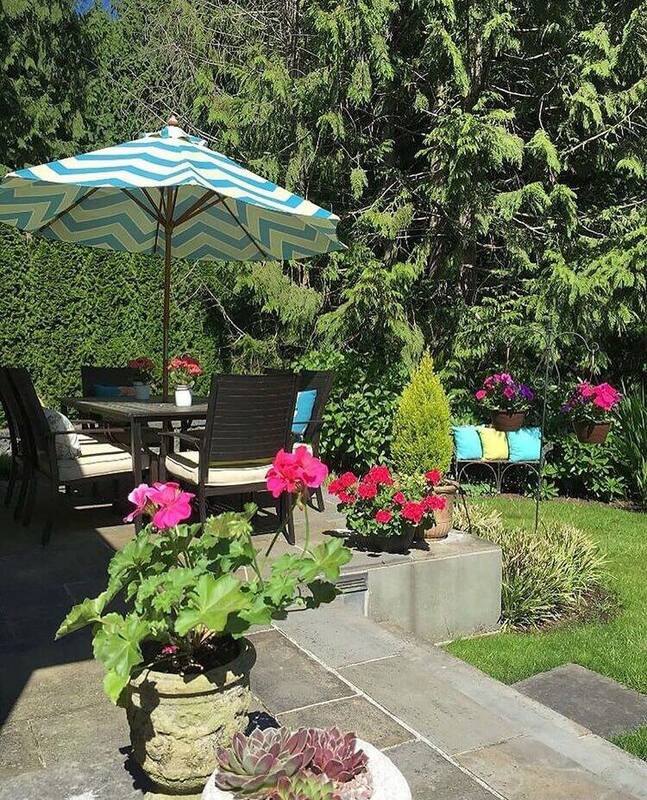 Beautiful blog post Summer, keep them coming! Hi! My name is Summer. I'm a wife and mother who enjoys adventures and traveling but really loves being at home with her family. 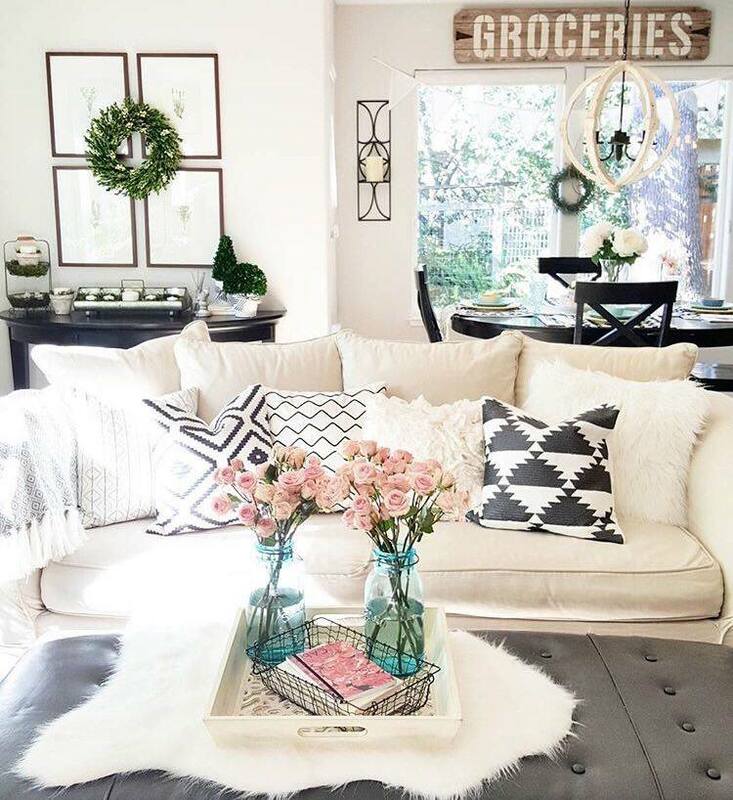 This is where I share the things that bring me joy as I share with you how I create a home and lifestyle of inspiration!